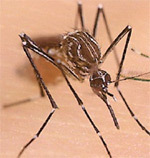 The bite of the female Aedes aegypti mosquito can transmit the virus that causes Dengue fever to humans. The days of the flying mosquito may be drawing to a close. In a study published in the February 22nd issue of the Proceedings of the National Academy of Science, a team of American and British researchers report that they have engineered a mosquito in the lab that produces offspring that cannot fly and consequently cannot infect humans with the virus that causes Dengue fever (full article). Their findings may lead to a sustainable mosquito population suppression strategy that dramatically reduces human morbidity and mortality from a variety of diseases transmitted by mosquitoes. In this study, the scientists specifically focused on the Aedes aegypti mosquito that causes Dengue fever. The researchers manipulated the genetic material of the males of this species in the lab to carry a novel trait: the inability to fly. When these modified males were mated with normal, wild-type females, they passed the trait on to their female offspring. By rendering the female offspring flightless, the scientists effectively imposed a death sentence on this group. If the females cannot fly, they cannot elude predators, mate with males, escape from water, or seek out human blood. Most importantly a flightless female may lead to the eradication of Dengue fever, since the disease is transmitted by the bite of female Aedes aegypti mosquitos. The next step for the researchers is to study the mating competitiveness of the modified males in the wild and whether their flightless female offspring will actually suppress the wild-type population as predicted. Additionally, the methods used by these scientists could be adopted to control other species of mosquitoes that spread serious diseases such as West Nile virus and malaria. Dengue fever is a flu-like illness with no vaccine or treatment that infects 50-100 million people each year in over 100 countries in tropical and subtropical climates, including Puerto Rico and tourist destinations in Latin America and Southeast Asia. It is the most common mosquito-borne disease and the CDC estimates that one third of the world’s population lives in areas where the disease is endemic. Other diseases transmitted by mosquitoes include West Nile virus, malaria, Rift Valley Fever, and Yellow fever. Taken together, these illnesses represent growing public health issues that require effective and sustainable mosquito population control measures. The flightless mosquito may just be the answer to this urgent problem.